Food is plentiful on Carnival Dream, and one of the things we love most about the ship (and Carnival, in general) is its variety of high-quality complimentary dining. Food in the main dining rooms is good, while the buffet can be hit or miss. A few themed buffet stations -- including the Mongolian Wok and Indian Tandoor, which Carnival brands as separate venues -- are especially tasty. Note: Dietary restrictions can be accommodated in the main dining rooms, and gluten-free pies are available at Pizzeria del Capitano. You'll find much less flexibility in the buffet, where nothing (other than sugar-free desserts) is marked as gluten-free, low-cholesterol or low-sodium. 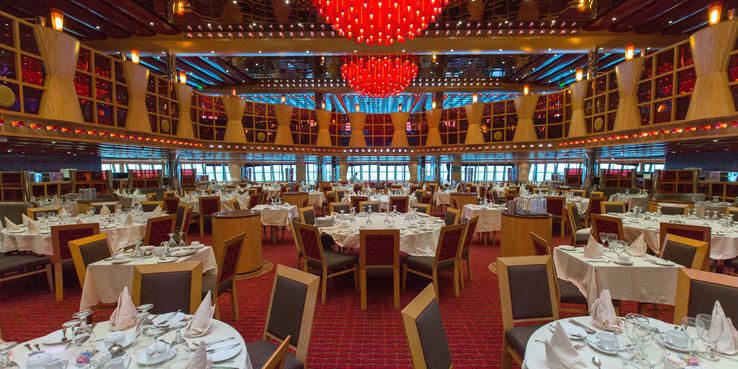 Scarlett and Crimson Restaurants (Decks 3 and 4, aft and forward): Carnival Dream's two main dining rooms (named for their red decor) are the "default" dinner options -- and passengers can choose between one or the other, depending on when they prefer to eat. Both offer set time, assigned-table seating at 6 or 8:15 p.m., but only Crimson is used for Your Time dining (no assigned tables or dining times). Note: If you don't get to the dining room within a half-hour of opening or more than an hour after opening, expect a half-hour or longer wait. Dining is divided into two types of nights, American Table and American Feast. Most nights are American Table; tables have no tablecloths for a more relaxed feel, and the menus focus on modern American cuisine. At least once per cruise, passengers are treated to American Feast nights (which coincide with Cruise Elegant nights), when the white tablecloths and beach-inspired silvery centerpieces come out. On these nights, waiters will pour your water for you; on other nights, you have your own carafe so you can refill your water glass as needed. Menus on American Table nights feature several appetizers, salads, entrees, side dishes and grilled items that are available every night; steakhouse selections -- lobster, New York strip steak and grilled lamb chops -- cost extra. Other than the everyday grill items (fish, beef, chicken and pork) and the rotating, but repeating, side dish choices, menu items change every day. Examples of appetizers include prosciutto ruffles, chilled peach soup, shrimp cocktail, seared tuna, vegetable spring rolls and fried calamari. Main course options might include barbecue pork spareribs, braised short ribs, chicken Milanese, seared tilapia, veal Parmesan and baked ziti with ham. Our favorite entree, by far, was the cinnamon pumpkin cheese pie -- basically a shepherd's pie with pumpkin filling. At least two vegetarian dishes also are available most nights. One is always an Indian dish like lentils with basmati rice, papadum and raita, while the others might include grilled tofu steak, quinoa-baked tomato, crisp portobello mushrooms and vegetable lasagna. You'll also notice a "rare find" dish every night, which allows diners to try something they might never have tasted before. Choices might include braised rabbit, escargot and ox tongue, among other exotic dishes. The last section, labeled as "Port of Call," includes a featured cocktail (for a fee) and an appetizer and main course that represent the day's port of call. On sea days, this section handpicks various dishes from the region, such as the Western Caribbean. In Cozumel, for example, our choices included a margarita, tortilla soup with braised chicken and steak tacos. Desserts also change every night, except for Carnival's signature (and delicious) chocolate melting cake, which is available every night. Other choices might include s'mores parfait, coconut lime cake and passion fruit flan. American Feast night menus are much smaller than American Table menus, with seven appetizers, 10 entrees (including the four everyday grill items) and the three extra-fee steakhouse selections. Options might include shrimp cocktail, New England clam chowder, teriyaki salmon fillet, grilled jumbo shrimp, dual of filet mignon and short rib, and an Indian vegetarian dish. Scarlett also hosts breakfast on port days from 7 to 9 a.m. and Carnival's SeaDay Brunch from 8:30 a.m. to 1 p.m. Sea days are the only time cruisers can get lunch items in the main dining room. SeaDay Brunch menu items (all of which have fun, cutesy names) include French toast, pancakes (gluten-free available), eggs Benedict, omelets, steak and eggs, huevos rancheros, a bagel with cream cheese and smoked salmon, and cottage cheese with fresh fruit. If it's lunch you're hankering for, your choices include tomato soup, Caesar salad, pork chop, mac 'n cheese, pasta and grilled salmon. The "Port Day Express Breakfast" allows passengers to fuel up before getting off the ship, with quicker, more protein-filled options like avocado toast, a Spanish omelet, corned beef hash, egg white frittata, yogurt parfait, and lentil and rice crepe. The avocado toast easily was a favorite -- served on whole wheat toast with avocado spread (and topped with avocado slices) and poached eggs. The menu, which comes with the tagline "done fast, done right, in and out in 25 minutes," also has pastries and griddle options, a section with lighter fare, fruits and grains, and sides; vegetarian options also are noted. Another dining experience held in Scarlett, only on sea days, is Tea Time. Open from 4 to 5 p.m., Carnival Dream's tea time is a throwback -- albeit a bit gimmicky -- to the days of genteel Atlantic crossings. Waiters seat diners and offer up a selection of teas, finger sandwiches and small dessert items (think a variety of desert biscuits and tortes). Guy's Burger Joint (Deck 9): Helmed by Food Network personality Guy Fieri, this poolside grill serves up some of our favorite burgers at sea from noon to 6 p.m. The menu includes six different types of burgers, and each comes with a side of hand-cut fries. Diners choose a burger, then dress it to their liking at the toppings bar, with basics like lettuce and tomato, heavier flavors ranging from sauteed onions to bacon crumbles, and a variety of sauces (we recommend the chipotle mayo). There's almost always a line at Guy's Burger Joint (unless you go toward the end of the day, right before the first main dining room seating), but it's well worth the wait. Veggie burgers are available upon request. BlueIguana Cantina (Deck 9): Across from Guy's, on the other side of the pool is the BlueIguana Cantina. This popular venue serves made-to-order burritos and tacos for breakfast (7:30 to 10:30 a.m.) and lunch (noon to 2:30 p.m.). When ordering a burrito, start by choosing a wheat or jalapeno wrap and a main filling (steak, chicken or shrimp for lunch and chicken sausage, ham or scrambled eggs for breakfast), then stuff it with as many ingredients as you like. The taco line moves a little quicker, as all diners have to do is choose between chicken, fish or pork, and finish it off at the salsa bar. The salsa bar includes standard toppings like Monterey Jack cheese, onions and cilantro as well as more unique options such as watermelon and jicama sauce and black bean and corn. Guy's Pig & Anchor Smokehouse (Deck 5): Another venue developed by Guy Fieri, this savory spot is only open on sea days, for lunch (noon to 2:30 p.m.). Expect to wait in line, regardless of what time you show up (we recommend avoiding after 2 p.m., as the last-minute rush can get crazy). The crowds are a testament to how delicious this newer venue is. Who can resist smoked meats, drenched in savory sauces? Served buffet-style by attendants behind a small counter, Guy's Pig & Anchor Smokehouse menu items include smoked andouille sausage, pulled pork, mac 'n cheese and potato salad. The hand-washing stations came in especially handy, here. The Gathering Buffet (Deck 10 and Deck 11): Carnival Dream's Lido Deck buffet is appropriately called The Gathering, as that's where everyone gathers for breakfast, lunch and dinner. Despite the large number of stations, the quality and variety of food in the main buffet section isn't always the best, and the lines at spots with the best food like the Mongolian Wok and Indian Tandoor reflect that. The Gathering is most popular for breakfast and lunch, when, on a sea day, you'll often be hard-pressed to find a seat, despite the buffet's size. Breakfast starts early with a continental breakfast of yogurts, pastries, cereals and fruits at 6:30 a.m. Hot dishes including eggs, omelets, pancakes, sausage and bacon, are served starting an hour later, with the bulk of the breakfast service ending at 10:30 a.m. Late risers will find a smaller selection of food between 10:30 a.m. and noon. Self-service breakfast beverage stations with orange and apple juices, as well as an orange punch, water, tea (iced and hot) and coffee are scattered throughout The Gathering. The Gathering is at its most crowded during lunch, when the buffet is divided into several distinct sections. (Note that on port days, only half the buffet is open.) At the start of most stations, you'll find an array of salad fixings, as well as cheese and cold cuts. Other stations focus on specific types of foods, such as deli sandwiches and carved meats. There's also a dessert station, located at the back of the buffet (Deck 10). Dinner in the buffet, referred to as Good Eats, is much less crowded and the limited food offerings reflect this. Only two stations are open, and both serve the same dishes. Sample items include New England clam chowder, stuffed mushrooms, pasta, barbecue chicken, roast vegetables and a carvery option. Free drinks from the self-service beverage stations during lunch and dinner include lemonade, iced tea, water and coffee. Two self-serve, soft serve ice cream stations -- named Swirls -- also are located on either side of the buffet entrance (coming from the Lido Deck). Mongolian Wok (Deck 10): Probably the most popular buffet station at lunch, Mongolian Wok almost always has a line -- and we promise, it's worth the wait. (Tip: You'll find much shorter lines on a port day.) Choose from two types of noodles, a salad bar's worth of fixings (bamboo, bok choy, spinach, onions, sprouts, broccoli, cabbage, plus more), three sauces (black bean, Thai barbecue and Sichuan) and one of three proteins (chicken, shrimp or beef). Pizzeria del Capitano (Deck 10): On the opposite side of Tandoor, Pizzeria del Capitano is Carnival Dream's "new and improved" pizza joint. The line touts imported Italian flour and fresh mozzarella as key to its recipe, but we actually found some of the pies to be a bit lackluster (a rubber-like consistency and bland taste). Despite being hit or miss, it's still a convenient spot to grab a slice any time of day (it operates 24 hours) and others seemed to enjoy it. Pasta Bar (Deck 11): Located one deck up from the main level of The Gathering buffet, the Pasta Bar allows you to customize your own pasta -- marking down the type of pasta you want (five choices, including gluten-free), as well as what sauce and the toppings (meats and veggies). Side orders include a Caesar salad and bread. You can either eat upstairs or ask for your pasta in a to-go plastic bowl to take downstairs. Carvery (Deck 10): The carvery can be found in the back of the buffet. One meat choice is offered per day and might include veal, roast turkey, ham and other meat cuts. Carnival Deli (Deck 10): This lunch spot offers made-to-order wraps, sandwiches and bagels -- with both cold and hot selections. Options include tuna salad on white bread; smoked salmon on a bagel; and arugula, roasted peppers and mozzarella on focaccia. Room Service: Available 24 hours a day, seven days a week, the room service menu on Carnival Dream is divided into free options and for-fee choices. For free, you can order sandwiches such as tuna, roast turkey, ham and cheese, BLT, grilled cheese and grilled Reuben; light dishes like garden salad, Caesar salad and a vegetable platter with dip; and desserts. There's also a basic, continental breakfast menu that allows you to select items and place your order by hanging a menu card outside your door the night before. Bonsai Sushi (Deck 5); a la carte: Added during Dream's January 2017 refurb, Bonsai Sushi is a Carnival favorite. The open venue -- located along the interior walkway, near Ocean Plaza -- serves up sushi and sashimi, as well as a small variety of appetizers and sides. While all the food was impressive, our favorite dish by far was the salmon tiradito (essentially a fancy way of serving sashimi) with blue cheese cream and dashi-infused citrus tea. The ambiance is cozy and casual, yet trendy, and its location adds a fun, social element to it. Single sushi rolls start at $1.50, and larger rolls cost between $5 and $7. Bonsai Sushi is open every night for dinner, from 5 p.m. to midnight, as well as sea days for lunch (the menus are the same). No reservations are required. Chef's Art Steakhouse (Deck 12); $38: Carnival's Dream's date night and celebrations restaurant, the Chef's Art Steakhouse, is an intimate spot tucked away at the top of the ship -- blink and you'll miss the entrance. The service is superb, and the food is excellent. Menu items include eight appetizers and four salad choices (choose as many as you like), 10 entrees and five side dishes (order as many as you like). Among the appetizers are escargot, beef carpaccio, ahi tuna tartare, jumbo shrimp cocktail and lobster bisque. Entrees include New York strip, cowboy and ribeye steaks, filet mignon, surf and turf, lamb chops, lobster ravioli and broiled rosemary-infused chicken. There's also a fish of the day special. Vegetarian choices include the baked onion soup (appetizer) and all four salads. Sides include baked or mashed potatoes, sauteed mushrooms, creamed spinach and steamed broccoli. Chocoholics should try the chocolate sampler for dessert, which comes with four mini desserts. When making a reservation, ask about the promotion that includes a free bottle of house wine with your dinner. Chef's Table (Crimson Annex, Deck 3); $75: Foodies will love the Chef's Table, offered two to three times per weeklong sailing, usually on port evenings. Limited to a dozen passengers at each dinner, participants are first invited to tour the ship's galley with the head chef while sipping wine (included in the cost of the dinner). After the tour, a multicourse meal is unveiled one dish at a time. Green Eggs and Ham Breakfast (a main dining room); $5: Offered on one sea day per cruise, this somewhat silly, family-centric breakfast is for lovers of everything Dr. Seuss, with Cat in the Hat-inspired decorations including red and white tablecloths and napkins. The menu is the best part of the entire experience with items like green eggs (they really are green!) and ham, waffles filled in with red and blue squares and topped with Fruit Loops, striped yogurt parfaits and red pancakes stacked high. Kids can pose for photos with the Cat in the Hat, as well as Things 1 and 2. Plaza Cafe (Deck 5); a la carte: If you've craving a specialty coffee or an ice-cream shake, then Plaza Cafe is the spot for you. Here you'll find an array of coffees (including iced and spiked varieties), teas and chai lattes, plus milkshakes, cookies and slices of delicious-looking cakes. Plaza Cafe is located in one corner of the Ocean Plaza, so you can run over in between trivia sessions to grab a hit of caffeine. Prices range from $1.95 to $5.95. After breakfast hours, the Plaza Cafe begins to serve a la carte gelato -- with flavors such as rocky road, French vanilla, mint chocolate chip, cookies and cream, and dulce de leche. A small cup costs $2.95, and a large is $3.95. Room Service: For an extra fee of $2 to $6, you can order hot dishes, including Buffalo wings (with five choices of sauces), spicy fried firecracker shrimp, chicken quesadillas, Philly cheesesteaks, pan pizzas and fries (regular or sweet potato). For dessert, a banana split will set you back $4 through room service.